Ghoom, also spelt Ghum, is located about 6 kms (or 3.7 miles) from Darjeeling. 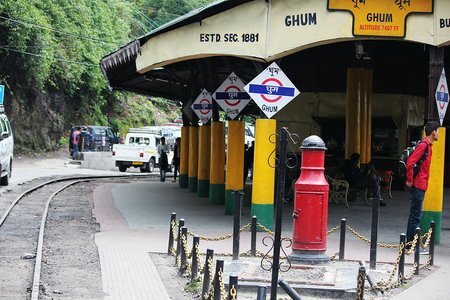 While approaching Darjeeling along Hill Cart Road, you will pass by the Ghoom Railway Station. Ghoom is at an altitude of 2225.7 meters or 7407 ft. This is the highest point of Darjeeling Himalayan Railway from where the Toy Train starts its descend towards Darjeeling town. An engineering marvel here at the Batasia Loop lets the train take a spiral loop and negotiate a sudden 1000 ft. drop before getting into the track with a more gentle gradient. 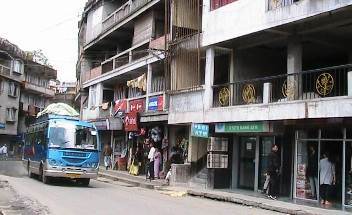 From Ghoom, it takes about 20-25 minutes by a vehicle to reach Darjeeling town center or the main market area. Ghoom is a junction point of many roads that lead to different destinations. Hill Cart Road that connects Darjeeling passes through Ghoom and all the way down to Siliguri. The road goes via towns like Sonada and Tung, and then Kurseong which is about 24 kms away. There is a road from Ghoom that goes to Kalimpong which is 45 kms away and then a bifurcation to Gangtok. There is another scenic road that goes through lovely tea gardens to Mirik and onward to Siliguri. This road goes via Sukhiapokhri (11 kms from Ghoom). It takes about 4 hours by car to reach Siliguri from Ghoom along this route. Another road from Ghoom goes to Mongpu. There are several attractions in the Ghoom area. 1) Samten Choling Monastery: While coming from Darjeeling, along Hill Cart road you will see this Monastery on the right as you enter Ghoom. 2) Old Ghoom monastery: Although Samten Choling Monastery is also locally known as Ghoom monastery, the original Ghoom monastery is located further down and on the narrow old military road near Sterling Resort. 3) Batasia Loop: Close to Samten Choling Monastery is the Batasia Loop. At Batasia the toy train takes a double spiral loop amidst a wonderful manicured garden overlooking the Eastern Himalayan. 4) There is a War Memorial constructed at the middle of Batasia loop to commemorate the Gorkha soldiers from Darjeeling hills who sacrificed their lives in various wars following India's independence. 5) DHR Ghoom Museum: Right next to the Ghoom Station, there is a Darjeeling Himalayan Railway Museum which has the oldest DHR engine the Baby Sivok in its premises. The museum also hosts a wide range of old artifacts of the railways along with rare pictures of the toy train. One of the greatest attractions in the Ghoom area is Tiger Hill which is famous for its spectacular sunrise view. On a clear morning, you can see the dazzling snow peaks of Kanchenjunga with rapidly changing colors. When you come from Darjeeling, after Ghoom station and in Jorebunglow area, a sharp right turn from the Hill Cart Road along the uphill Senchal road leads to Tiger Hill. From Ghoom, distance of Tiger Hill is 5 kms. The Jorebunglow Degree College is located close to where the Senchal road starts. The lovely Senchal Lake which is part of a wild life sanctuary is also located in the same area, although not on the same road. The Old Military Road from the Ghoom/Jorebunglow area leads to the lake which is about 3kms away from Ghoom. Along the road that goes to Sukhiapokhri from Ghoom, you will find the Ghoom Hill (also known as Ghoom Rock), a huge 100-ft high rock from where you get magnificent views of the Balsan valley and the mountains. A new amusement park Garg World has come up in this area.